Yusuff Ali MA, Chairman of LuLu Group, on Monday announced his company's intention to invest $150 million (Dh550m’ Rs1,000 crore) in Uttar Pradesh's state capital Lucknow, where he plans to build a convention centre, shopping mall and a five star hotel. Announcing his plans in Agra in the presence of the UP Chief Minister Akhilesh Yada, Ali said his new initiative in UP will generate 3,000 new jobs in the state, in addition to 2,000 people from UP working in his food processing plants in India. A statement from Lulu said he addressed crowds at the maiden UP Pravasi Diwas last Monday. The Indian businessman from Abu Dhabi, with a reported net worth of $3.4 billion, ranked 24th on Forbes' list of India's richest 100 in 2015, also donated $2 million to build sports complex for boys and girls in the Aligarh Muslim University, which recently granted him a honorary doctorate. “As a businessman I travel to many countries. But whether I go to Europe, Asia or Far East, or in the Gulf countries, I find NRIs from Uttar Pradesh and the state of Kerala. When I went to Kenya, my friends in the business said ‘Humara tan Africa mein hai, Humara dhan London mein hai, lekin humara man Hindustan mein hai,’” the statement quoted him as saying in Agra. “I have a very close association with Uttar Pradesh. Nearly 2,000 persons from UP are working in our food processing companies. I was offered a doctorate by different universities of the world, but the only one I accepted was from Aligarh Muslim University in UP. After receiving the doctorate there I mentioned the need for sports and for students to have sports complex to promote health. I donated Rs5 crore to construct a sports complex for boys. Now another Rs5 crore for girls." Announcing on Monday that the investment in UP will create an employment for 3000 people, Ali added, "I don't believe in declarations, we believe in work. If everything is ready, we promise to begin our construction." 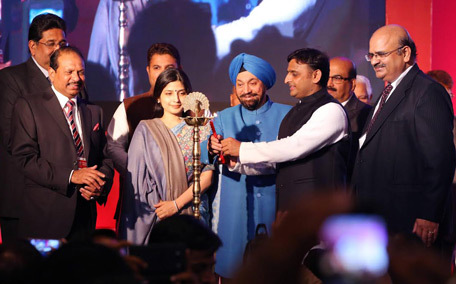 The statement quoted the chief minister of UP Akhilesh Yada as saying that the Pravasi Diwas was a positive start to the state government's efforts to reach out to its non-residents and for the state machinery to facilitate their connection with roots. "I welcome Ali's promise to invest in Uttar Pradesh. The government will make every effort to ensure that land and any other assistance is provided to him so that he can begin work," the statement said. Yadav is also quoted as saying that he was hopeful that the more such proposals for investment are announced over the next day of deliberations - the second and last day of business at the UP Pravasi Diwas.